TSH is a hormone secreted by the brain’s pituitary gland to control the activity of your thyroid gland. TSH stands for thyroid stimulating hormone and as its name suggests, it stimulates the thyroid to produce thyroid hormones. Levels of TSH affect the production the hormones triiodothyronine (T3) and thyroxine (T4). Doctors usually test TSH level to see if it’s within the normal range if you show symptoms of an overactive or underactive thyroid. You may also have to regularly go for a TSH blood test or T4 blood test if you are receiving hormone treatment for a thyroid condition. Optimal TSH levels are critical for your body’s function, including your general health and wellbeing. Thyroid hormones help control your metabolic rate, heart function, nervous system, and digestion. Although TSH isn’t classed as a thyroid hormone, high or low TSH levels can disrupt levels of T3 and T4. This can result in symptoms of hyperthyroidism or hypothyroidism. In this article, you will find out all you need to know about TSH and how it affects your thyroid hormone levels. You will also learn about thyroid-related symptoms if TSH levels are higher or lower than the normal range. The hypothalamus, in the base of the brain, releases TRH (thyrotropin-releasing hormone) to stimulate the pituitary gland. The pituitary gland then produce TSH to stimulate production of thyroid hormones (T4 and T3) that affect almost every organ in your body. In optimal conditions, TSH levels ensure that just enough T3 and T4 hormones are released into your bloodstream. 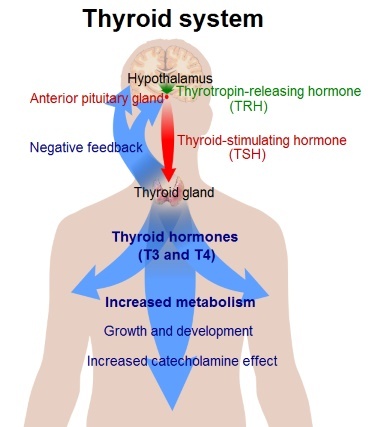 The chart below helps you see how TSH controls the thyroid. The information on the levels of thyroid hormones in your blood is then fed back to your brain. This is called the feedback loop. As T4 and T3 levels in the blood rise, feedback to your brain tells it to produce less TSH. However, if thyroid hormones levels are too low, your pituitary gland will produce more thyroid stimulating hormone to increase thyroid hormone levels. T3 and T4: What Are They? 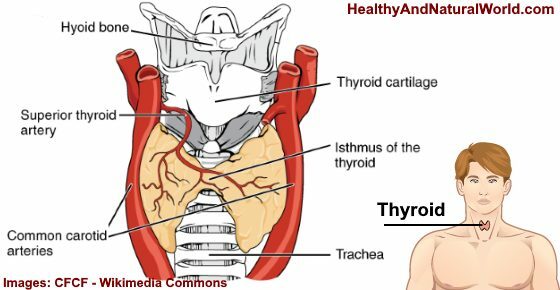 Triiodothyronine (T3) and thyroxine (T4) are two thyroid hormones that TSH stimulates. T3 and T4 hormones usually bind themselves to proteins in the blood where they are delivered to your cells. Some hormone, however, doesn’t attach to protein and this is called free T4 or free T3. Doctors will usually test for free T4 (FT4) to see how much of the hormone is available for your body’s energy requirements. If your TSH levels are abnormally high or low, doctors will usually arrange for free T4 or free T3 blood test. These tests can help doctors diagnose if you suffer from hyperthyroidism (overactive thyroid) or hypothyroidism (under active thyroid). Dr. Starr recommends testing TSH levels under a doctor’s supervision rather than doing a hypothyroidism test at home. This is because individuals with TSH in the range of 2.5 – 4.0 mIU/L are considered to be in the risk group for developing thyroid disorders. However, it is accepted that the normal TSH range increases with age. Let’s look in more detail at the normal levels of TSH that are age-specific or take into account pregnancy. Depending on the lab, some doctors give the normal TSH level as 0.4 – 4.2 mIU/L. Thyroid-stimulating hormone can fluctuate during pregnancy due to the baby’s growth and extra stress on the thyroid. Generally, high TSH levels are an indication of an underactive thyroid or hypothyroidism. TSH level below 0.4 mU/L is considered low. Your pituitary gland may not produce enough TSH if your thyroid is secreting more than normal thyroid hormone. Low TSH levels and high T4 and T3 levels usually are a sign of an overactive thyroid (hyperthyroidism). Below is a TSH levels chart so that you can easily see what the normal thyroid levels are. 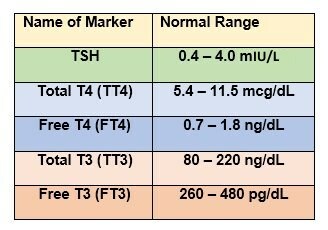 The chart helps to show TSH, T3, and T4 levels and what you should expect to see on your lab test results. It can be challenging for doctors to know the optimal thyroid levels for each patient because a number of factors need to be taken into consideration. For example, as research on treating hypothyroidism has shown, not all doctors agree on what should be classed as “normal” or high TSH levels. The traditional approach to interpreting hypothyroidism test results was to have a cutoff point at around 4.0 or 4.5 mU/L. However, some doctors challenge this and say that the normal TSH level shouldn’t be above 2.5 mU/L. When aiming to find optimal thyroid levels when treating hypothyroidism, a doctor’s goal is to see improvement in the patient’s symptoms. This could mean that an individual’s optimal thyroid level may need to be closer to the lower end of the TSH “normal” range rather than being in the middle. There are other factors that should be taken into consideration when determining optimal TSH levels. Let’s look at the effect age, diabetes, and heart conditions are associated with a thyroid disorder. As we get older, our pituitary gland increase TSH hormone secretion and therefore optimal TSH range for an older may be higher than a younger person. Another issue facing doctors when finding the optimal thyroid levels is how thyroid function affects the heart. One of the problems of just relying on the TSH test to check for signs of thyroid dysfunction is that it doesn’t provide a complete picture of thyroid levels. First of all, as I’ve already pointed out, there is no consensus of opinion on what counts as high TSH levels. Most doctors stick to the traditional reference range of 4.5 mU/L, however recent studies advise the normal TSH range to be lowered to 2.5 mU/L. Many clinics now offer combined screening for TSH levels along with checking levels of thyroxine (T4). So, if you still feel unwell and your TSH levels are not abnormal, ask your doctor to perform tests for free T4 and T3. There are additional tests that check the health of your thyroid that provide more results than just TSH levels in blood serum. NCBI. How does the thyroid work? WebMD. What is a TSH test? MedicineNet. Medical definition of triiodothyronine. U.S. National Library of Medicine. Thyroid function tests. J Clin Endocrinol Metabol. 2013 Sept;98(9): 3584-3587. J Clin Endocrinol Metabol. 2012 Sept;97(9): 3170-3178. Clin Chem. 2015 May;61(5) 704-713. J Clin Endocrinol Metabol. 2013 Mar;98(3): 1147-1153. J Diabetes Res. 2013; 2013: 390534. Best Pract Res Clin Endocrinol Metab. 2013 Dec; 27(6): 745–762.